Paul Hill's fascination with the arts began at early age, observing his grandfather work in his photography studio. He describes the experience as watching him "paint with light". Paul started his own art career as an illustrator and painter. While exploring his creative process, he felt a brewing desire to push his work into 3 dimensions, and made the transition from acrylics and ink to metalworking about 10 years ago. Paul's metal artwork is truly extraordinary and inspiring. He is a prolific sculptor and a positive force in the public art scene. 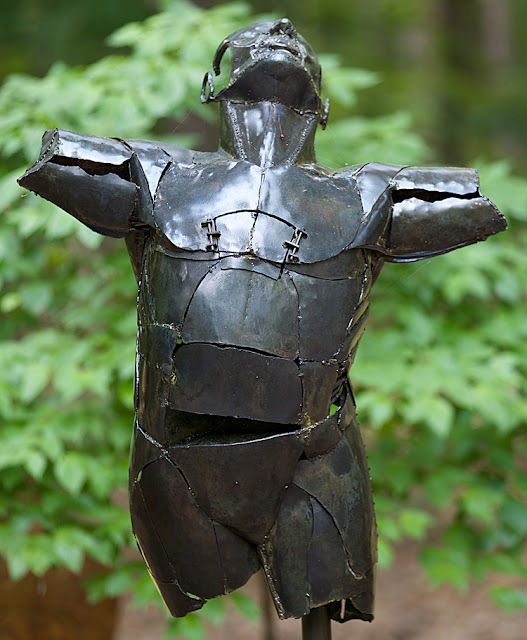 This formed and welded steel sculpture is titled "For No Apparent Reason". 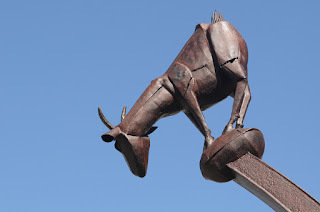 It was inspired by Moroccan goats that actually climb trees to feed on their berries. Click here to watch a video of this interesting behavior. The piece is currently on display at the Cary Town Center. 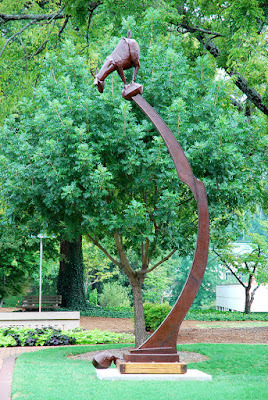 It was one of 10 finalists for the 2010-2011 Cary Visual Art Outdoor Sculpture Exhibition. 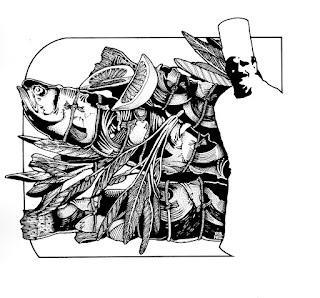 Part of the appeal of Paul's work is its humorous tilt. This piece will stop you in your tracks, make you look at the person next to you and say "...what?..." You are moved to figure out the meaning of this strange situation. Paul says he enjoys making "art that challenges people." Aside from creating work that is compelling conceptually, his craftsmanship and technical skill are top notch and are an excellent vehicle for his whimsical ideas. 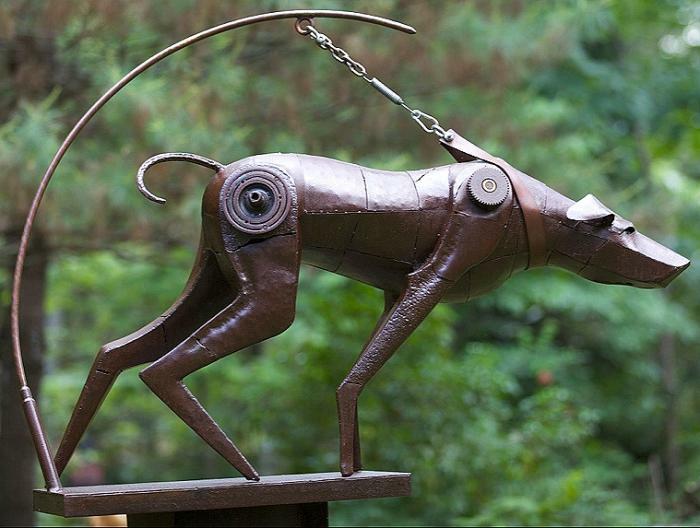 It is nice to see a metalworker creating such complete works of art, and Paul is very productive as well. Paul starts mapping out his hollow forms by making chalk drawings on his table. He works out basic proportions and compositions as he "captures the character" of his subject matter in silhouette. From the drawing Paul builds a 3 dimensional steel armature and makes any desired modifications to the form. Next he adds the sheet metal skin, which is hammer formed section by section. "Southern Hospitality" was purchased by Residents of Old Wilmington and is being donated to the city of Wilmington, North Carolina. 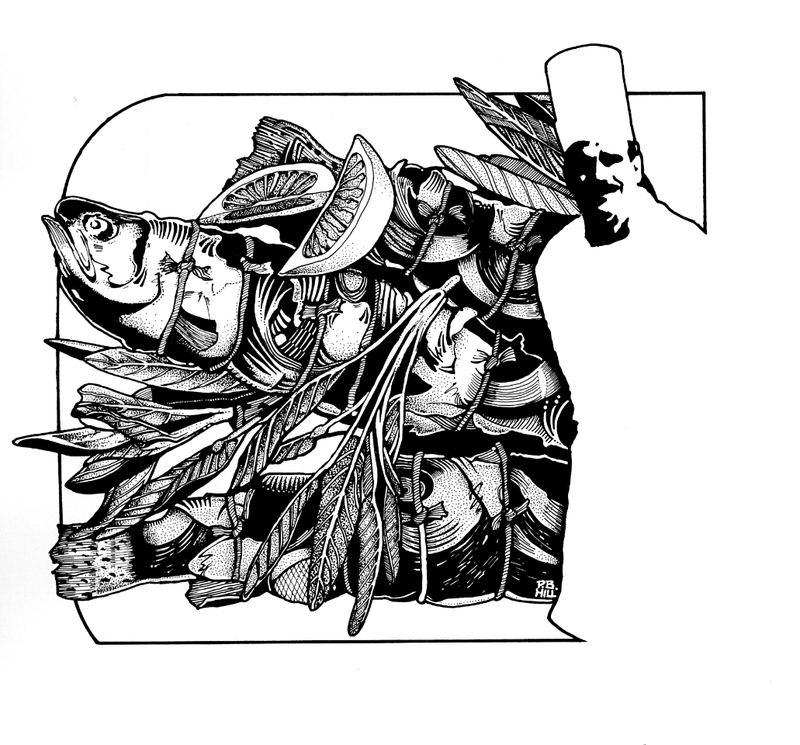 Paul's "Insatiable" Series addressing social issues of consumption and natural resources. Please take a moment to visit Paul's online portfolio and learn more about his incredible talent. He is available for commission work and public art projects, and has several pieces for sale on his website. He is an outstanding metalsmith and a thoughtful artist. This is an amazing body of work. Diverse and compelling, each piece is a surprise. thanks for sharing the artwork AND the hilarious goat video! Paul, you're just getting warmed up....can't wait to see what the future holds for you! This is beautiful work! I am especially impressed with "Natural Progression". Great work! It is nice to see beautiful metal art. Wow! Great metal works man! I'm so amazed with all your metal sculptures. Keep it coming. Wow, you are so talented! Great job! I love to buy metal artwork to decorate my yard. I usually go to the metal fabrication shop in brooklyn ny, but I think I will buy from you for now on. That is if you sell your work. Where are pieces of your work located to see through out the country? Thank you for sharing these photos! For the past ten years I have been designing and building unique metal creations ranging from the purely functional to the purely aesthetic. I enjoy the variety of my work. I may be making something as small as piece of jewelry one day, and then building a large sculpture the next. I have collaborated with other artists on several public art projects and commissions, and have taught metals workshops at The Chapel Hill Museum School of Traditional Arts Crafts and Culture, and The SAGE Academy Metal Shop at Central Carolina Community College, as well as private instruction at my studio. I enjoy making custom projects for my clients, and I sell finished works of art as well. I have a B.F. A. from East Carolina University and have attended multiple lectures and classes at the Penland School of Crafts and Peters Valley Craft Center. My work has been displayed at group exhibitions at The North Carolina Museum of Art, The Fayetteville Museum of Art, The Chapel Hill Museum, The Contemporary Art Museum in Raleigh, and The Green Hill Center for North Carolina Art, and Lede Gallery in Wake Forest NC.